Some people keep and breed venomous snakes because they are graceful. Some keep tarantulas because they are unique. And some keep stingrays for these same reasons. But all can be dangerous! In Colombia, health authorities register more than 2,000 cases of freshwater stingray incidents annually. Over a five year period in one small local hospital; there were eight deaths, 23 amputations of lower limbs, and 114 other cases where victims were unable to work. Veterinarians should be aware of these facts. 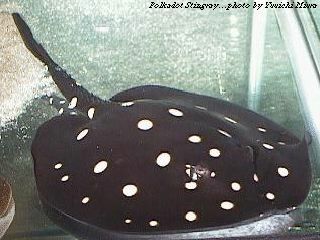 The stingrays are unique aquarium fish. They are found both in the saltwater and freshwater sections of aquarium shops and make unusual, appealing and fascinating additions to any large aquarium. Rays are members of the Class Chondrichthyes, or cartilaginous fish. There isn't a bone in their bodies; their skeletons are all cartilage! 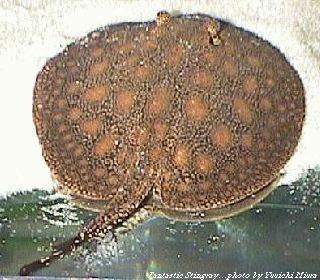 The stingrays are also placed in the Subclass Elasmobranchii, a distinction they share with sharks and chimeras (batfish). There are more than 150 species scattered among some 20 or so genera, most of which are found in pelagic waters and saltwater estuaries where they bottom feed on oysters, clams, and crustaceans. They own a good set of dental grinding plates and, coupled with their strong jaws, they easily crack open shellfish, bivalves, and other mollusks. But the impressive mouth parts of rays, although well suited for feeding, are not responsible for injuries to people. Human injuries, including a number of fatalities, are the result of being stung by their ``tail stingers." Rays vary in size from a mere 10 to 12 inches to some 6 feet in width, and most measure at least 3 feet long. Their tails are often almost twice as long as their bodies. 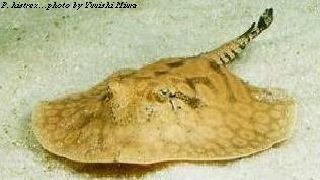 The most popular of the aquarium rays kept by hobbyists are the freshwater rays of South America. These are members of the Family Potamotrygonidae. Native people in South America where these fish are found are absolutely terrified by them, considering the often casual attitudes towards the vast number of other dangerous creatures in their realm. Reports of injuries inflicted on hobbyists by captive rays are rare and many such incidents, if they occur, may be so inconsequential that they are not reported in the literature. Nevertheless, the potential for both serious injury and sequelae of such injuries (as well as effects of stingray venom, should it be introduced into the wound ) exists for hobbyists and professional aquarists. Veterinarians called upon to treat or manage aquarium fish may also be consulted in such injuries, so an account of this subject is warranted. The stingray's venom apparatus is composed of the tail, or caudal appendage, along with a barbed spine and its enveloping integumentary sheath, and associated venom glands. There is a wedge-shaped area of tissue that is in close contact with the spine; thus, when the spine is lying flat against the dorsal surface of the ray, it is bathed in a melange of ven om and mucus. There is a great deal of confusion concerning the terms sting, spine, and barb. The sting properly refers to the entire structure: the spine, its sheath, and the venom glands. The term spine properly refers to the rigid surface of the sting, which is made of dentin. The barbs are the backwards facing serrations associated with the lateral aspect of the spine. Depending on species, one or more spines may be present on the dorsal surface of the tail. The barbs facilitate the tearing of the ray's integumentary sheath and the broadening of the victim's wound. Barbs also work like a backwards pointing fish hook and make disengagement more time consuming and traumatic. In short, the ``sting" of the stingray is a well-crafted, trauma- and venom-inducing apparatus that has survived the test of time over millions of years. Since it is not used for food gathering, its purpose may be purely defensive. The actual venom glands were passed upwards to some forms of more advanced bony fishes and air-breathing aquatic and terrestrial snakes, culminating, perhaps, in the world's only extant venomous mammals: the echnida and the duckbilled platypus, both of Australia. Curiously, in this same part of the world there resides the only known venomous bird: the oil bird of Papua, New Guinea. Evolutionary biologists have not, however, studied the evolution of venom glands and envenomating as a distinct subject, so therefore it is only possible to speculate how stingray venom glands and delivery systems are related to venom-producing functions in more advanced life forms. Stingrays are generally non-aggress ive and intelligent creatures. They have been called the ``pussycat of the sea" and devotees of diving programs on educational TV are often treated to images of scuba divers hitching a ride with some of the larger forms. This is a precarious activity at best, however, since the stingray's spine is in a perfect position to inflict injury to a human pressed against their dorsum. And if frightened, roughly handled, or captured, they react quickly by using their tail to place the sting in close contact with the object of their discomfort. Stingrays cannot raise or lower their stings voluntarily. The wound they inflict comes from the arching forward flick of their muscular tail. Envenomation occurs when the tip of the spine penetrates the ray's integumentary sheath and lacerates the skin of the victim simultaneously. Human injuries also occur during stingray capture, when people attempt to haul them into a boat. Another common scenario is for the victim, wading in shallow water, to accidentally step on a stingray buried just beneath the sand. In these instances, the ray flicks up its tail, usually lacerating the leg. Contrary to popular ``nature documentaries," it is extremely hazardous to swim directly over, or in close proximity to, a stingray. A flick of the tail is apt to pierce a person's body, and a serious, even potentially fatal, situation is in the offing. Stingray injury has two aspects: 1) immediate physical trauma from the powerful penetrating action of the spine, and 2) envenomation at the site of the wound with the contents of the ray's integumentary sheath. Although venom is not always deposited during a ``sting incident," these two insults often work in dangerous synchrony. Most traumatic injuries inflicted by rays occur to the lower limbs of bathers and boaters, and to the hands and arms of fisherman, hobbyists and other handlers. If a major blood vessel is lacerated, hemorrhage can occur and could even be fatal. There is at least one case in the literature of a victim whose femoral artery was pierced by the spine of a stingray; the victim bled to death. In about 5% of such injuries, the spine is broken off and remains in the wound, especially when the fish is pulled off the victim. Penetration of any part of the trunk (chest, abdomen, groin) is a serious medical emergency. Introduction of the ray's necrotizing venom directly into the body cavity of a person has been known to cause insidious necrotizing effects on the heart and other internal organs, and death is often inevitable. All stingray venoms are very similar. They contain serotonin, 5-nucleotidase, and phosphodiesterase. The latter two enzymes are responsible for the necrosis and tissue breakdown seen in stingray envenomations; serotonin is the cause of inexorable pain in the region of the injury. These actions will continue unabated if left untreated. Minor, untreated stings, particular ly among hobbyists, often result in lesions resembling bacterial cellulitis. Since the serotonin in stingray venoms produces severe and immediate onset of local pain, any sting that is relatively free of pain indicates that no actual envenomation occurred and the ``lucky" victim endured a ``dry" sting. This may be due to one or more of several reasons: the sheath was previously ruptured, releasing its venom store; the sheath failed to penetrate the wound; the sheath failed to rupture, so the venom remained contained; or, the spine had been broken off previously. But for those people who receive a dose of venom along with the physical trauma of being hit, the tissue necrosis and subsequent secondary bacterial infection that occurs as a result is extremely difficult to treat; and many months and several courses of intravenous antibiotics may be necessary. Stings to the legs should be treated, as well, by several weeks (or perhaps months) of bed rest to help prevent exacerbation of the necrosis and bacterial infection occasioned by the dependent position in which legs are kept when the victim stands upright or walks. Injuries from freshwater stingrays are extremely common in some South American countries where these fish are plentiful and come in frequent contact with local people. In Colombia, health authorities register more than 2,000 cases of freshwater stingray attacks annually. Over a five-year period in one small local hospital in that country there were eight deaths, 23 amputations of lower limbs, and 114 other cases where victims were unable to work for up to 8 months. It should be noted, however, that cl ear cause and effect reactions are not readily understood where reported systemic effects occur in stingray envenomations. Among the catalog of such effects are: diaphoresis, nausea, cardiac arrhythmia (flattened and biphasic T-waves), anxiety, headache, tremors, skin rash, diarrhea, generalized pallor, delirium, neuritis, limb paralysis, paresthesias, lymphangitis, abdominal pain, arthritis, fever, hypertension and hypotension, dyspnea, congestive heart failure, and syncope. Some of these effects can be explained by allergy and psychological reactions, and stingray experts are unsure as to the true extent to which systemic effects, or their absence, are consistent and dependable signs of a realistic prognosis. As an example, in one autopsy report a stingray envenomation to the chest in a 12-year-old boy was found to result in death due to necrosis of heart muscle tissue. This was the result of a freak accident wherein an ``airborne" stingray (caught on a hook and line and hauled into the boat) slammed against the child, using its spine to penetrate the left lung and pericardium, perhaps penetrating the heart itself. Asymptomatic for some time after the incident, the sequestered venom caused an insidious and unrelenting necrosis of the myocardium, culminating in right ventricular rupture and fatal cardiac tamponade. Stingray injuries almost always occur in inexperienced and/or uniformed people grappling with live, terrified rays, or those people unlucky enough to step on one while wading. Unprovoked attacks, probably based on some territorial imperative, have also been recorded. Aquarium stingrays make fascinating, unusual, bizarre and, yes, usually friendly inhabitants. Friendly when treated kindly, and conditioned accordingly (stingrays are classified as ``intelligent" compared to many other kinds of fish). But, it is also necessary to treat them with respect . Handling of aquarium captives must be kept to a minimum. Trying to net them is a foolhardy exercise. Moving them from one aquarium or transporting them should be done by devising some way of trapping them, underwater, removing the trap with them inside, and then releasing them at their destination. All but the smallest stingrays should NOT be netted. Extreme caution must be exercised at all times. This might include the handler wearing gloves and a heavy long-sleeved shirt. Although stingray injuries are more common than one would expect, deleterious sequelae are a rarity thanks to quick and careful disinfection of the wound, preferably under medical or veterinary supervision. Professional assistance is necessary to make sure there are no traces of venom left at the site by assuring that any remaining parts of the integumentary sheath or broken spine pieces are removed, surgically if necessary. These can be visualized by x-ray. 1. Control any visible hemorrhage; if a blood vessel is pierced, apply hard direct pressure, regardless of how painful that might be, over the source of the bleeding. 2. Do not apply a tourniquet or pressure bandage on the entire limb; widespread swelling and systemic effects are unlikely in limb bites. 3. Immediately place the bitten spot into water as hot as one can stand; caregivers might test it before placing the victim's sting in it. This should quickly help to lessen pain, and the area should remain immersed until pain subsides. 4. Disinfect the area immediately on removal from hot water. The sting area can be treated with Betadine [tm] solution and scrubbed with a soft bristle brush with clean cool water and a mild disinfectant soap, such as Phisohex [tm] or similar preparation. 5. Seek medical help even if the bite is considered trivial. The site should, at the very least, be x-rayed for the presence of broken spines and spine barbs. 1. Treating physicians can use an infiltrating injection of 1% lidocaine to control pain if indicated. The lidocaine infiltration can be made directly into the sting or wound. Curiously, this technique has proved to be helpful in minimizing tissue necrosis, although the mechanism is not clear. 2. If unbearable pain persists, the victim may require a regional nerve block, which should be performed by an anesthesiologist under controlled conditions. 3. The wound area should be radiographed for the presence of spine and barb fragments. 4. If the radiology results are positive or suggestive, the wound should be explored under anesthesia. The use of an operating microscope is helpful in confirming the presence of the sheath and smaller fragments, as well as aiding in their removal. 6. The patient should be observed in the hospital overnight for symptoms and signs of allergy, and these treated accordingly. 7. Tetanus prophylaxis should always be given, unless recently boostered. 9. If the patient is hospitalized, antibiotics can be loaded by injection or via an IV administration until discharge. The most troublesome expected sequelae of this type of sting are tissue necrosis and secondary bacterial infection. 10. All penetrating wounds of the trunk (as mentioned previously) must be thoroughly worked up. The patient should be admitted to the hospital and given IV antibiotics immediately. Insidious necrosis and bacterial infection of internal organs in the vicinity of such stings is a possibility, and can be a fatal result of such wounds, sometimes days or even weeks after the initial incident. Symptomatology may be absent until infection and tissue destruction become overwhelming. At this point, little or no result from medical intervention can be expected. 11. Penetrating stings to the chest in the region of the heart should be evaluated by echocardiography. The presence of even a small pericardial effusion may indicate pericardial and possibly myocardial penetration. Such cases should also be followed on the basis of serial laboratory studies of cardiac enzymes such as creatine kinase. CK levels have risen to high levels within 8 hours of penetration, but even this evidence may present itself critically late for meaningful intervention. A decision may need to be reached to open the chest and disinfect and clean the area of penetration prior to the possibility of cardiac muscle destruction. Author's note: Much of the information in the above discussion was gleaned from: Williamson, et al (eds). 1996. Venomous and Poisonous Marine Animals. University of New South Wales Press, Sydney. Any reader interested in aquatic organism envenomations and poisonings will find this comprehensive book extremely valuable. I thank Steve Grenard for the permission to use this article here on www.potamotrygon.de. 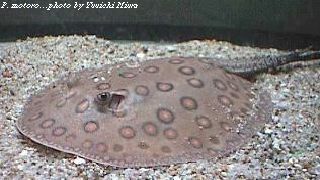 I also thank Yuuichi Miura for the Stingray pictures shown above.